Fairies in the Zelda series are largely of the English variety of tiny people with wings and magical powers, but there are exceptions. 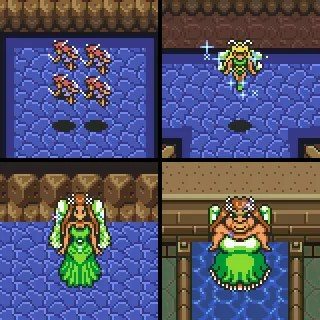 The Great Fairies in Ocarina of Time can fly without wings and look kind of like drag queens to me. And the ones in The Wind Waker are rather bizarre and ghostly in form. In the first game, fairies are established as living in ponds and restoring Link’s health when he approaches them. They’re also sometimes found captured by enemies. Later games, starting with A Link to the Past, give you the ability to trap a fairy in a jar and release them when you need a one-time health boost. They’ll also restore you if you die. Seems pretty cruel to keep what’s apparently a rational being in a jar. That’s worse than smashing some poor guy’s pots. 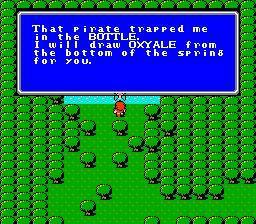 The fairy in a bottle motif is also used in the original Final Fantasy, although here it’s a pirate who traps her in a bottle and sells her to a desert caravan, from which you can buy the bottle at an inflated price. If the game wanted to be REALLY mean, the guy would have sold multiple bottles, only one of which contained the fairy. Anyway, the fairy lives in a pond in the town of Gaia, and can provide Oxyale to let the Light Warriors breathe underwater. 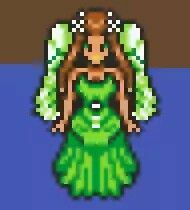 LttP also introduces some larger fairies, including their Queen Venus. Some of these fairies can upgrade your equipment. In one pond, if you drop a shield or a boomerang and then truthfully respond that you did so, the fairy will reward you for your honesty by giving a better one. This is apparently a reference to Aesop’s fable of the Honest Woodcutter. When this woodman drops his axe in the river, Hermes shows up and asks him if a gold or silver axe was the one he lost, and when he says no the god gives him all three. Another man observes this and purposely drops his axe in the river, but when Hermes offers the golden axe (hey, isn’t that a Sega Genesis game?) he immediately says it was his, for which untruth he ends up with nothing. Honesty is the best policy, except when it isn’t. I wish it were that easy to get a golden axe in Animal Crossing. Venus will increase your carrying capacity with bombs and arrows in exchange for an offering of money, and another fairy who lives inside Ganon’s pyramid will give you the Silver Arrows. 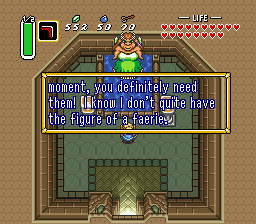 This fairy is noticeably fatter than any of the others, and she blames her figure on Ganon’s curse. In the Captain SNES comic, her sprite is used for Seraphina the Pabst Fairy, King Hippo’s ex-wife. 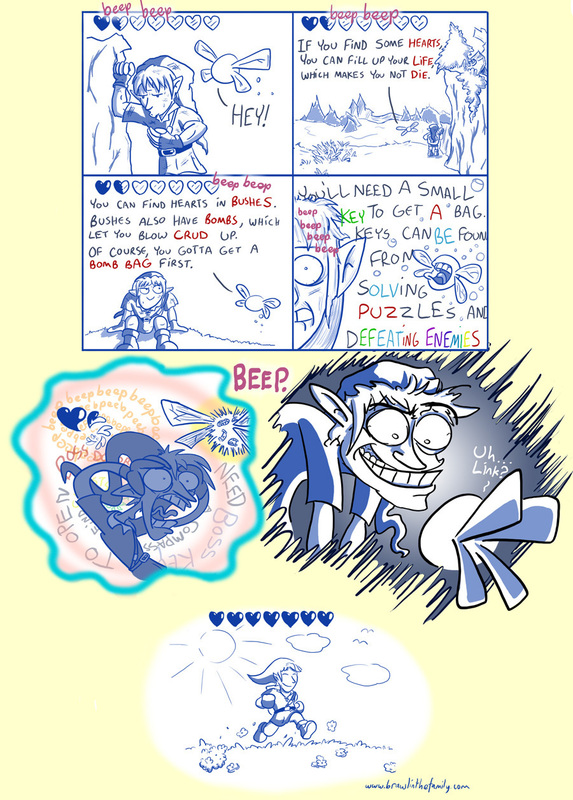 Link first has a fairy companion during his adventure in OoT, but the idea existed in some other media before this. The DiC cartoon series had a fairy named Spryte, daughter of King Oberon, helping out Link and Zelda; and in true Tinker Bell fashion she had an unrequited crush on Link. Companion fairies would become somewhat of a staple of the series, although they don’t appear in every Zelda game. Their powers might also be different, as they don’t seem to be able to heal Link. The Valiant comic series features a fairy named Miff who doesn’t have a lot of respect for Link’s tendency to act without thinking. 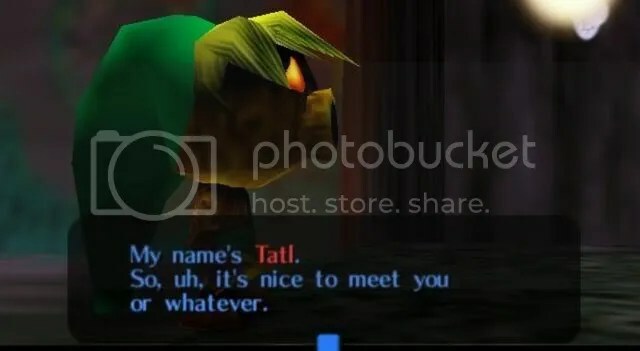 I understand that Tatl in Majora’s Mask is also rather rude to Link. There’s a fair amount of discussion on the Internet as to whether Link himself would be considered an elf, seeing as how he has pointed ears and dresses in green. He’s officially a Hylian, and I don’t believe the term “elf” is ever used in the series. Still, seeing as how Hylians have pointed ears and heightened magical abilities, they might well have been based somewhat on elves. The ears, at least according to legend, are so they can better hear messages from the gods. This entry was posted in Animal Crossing, Cartoons, Comics, Fairy Tales, Final Fantasy, Magic, Super Mario Bros. Super Show, Television, Video Games, Zelda and tagged a link to the past, aesop, captain snes, elves, epheremelda, fairies, gaia, ganon, hylians, king hippo, light warriors, link, majora's mask, miff, na'vi, nintendo comics system, nintendo power, oberon, ocarina of time, oxyale, queen venus, seraphina the pabst fairy, spryte, tatl, the honest woodcutter, the legend of zelda, the wind waker, tinker bell. Bookmark the permalink.